Last Week: South Point defeated Boyd County 20-12, in South Point; River Valley lost to Gallia Academy 49-7, in Bidwell. Last meeting between the teams: September 9, 2016. River Valley won 39-18 in South Point. Current head-to-head streak: River Valley has won 1 straight. SPHS offense last week: 87 rushing yards, 16 passing yards. RVHS offense last week: 98 rushing yards, 163 passing yards. SPHS offensive leaders last week: QB Joel Morrison 4-8-1, 16 yards, 1TD; RB Joel Morrison 17 carries, 48 yards; WR Cade Brandt 2 receptions, 18 yards, 1TD. RVHS offensive leaders last week: QB Patrick Brown 13-20-1, 131 yards; RB Gabe Stapleton 8 carries, 55 yards, 1TD; WR Layne Fitch 4 receptions, 61 yards. 1. Time to bounce back. Last Week, the Raiders suffered their largest setback since Week 9 of the 2014 season, when Athens topped RVHS by 63 points. 3. The Raiders have used a balanced attack in its first two games, running for 289 yards and three touchdowns, while passing for 264 yards and two scores. 4. 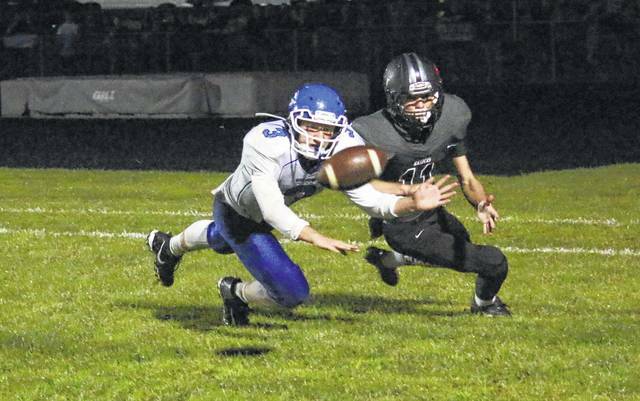 River Valley has had trouble slowing down the running game, surrendering 679 yards and seven scores on the ground. Meanwhile, RVHS has only given up 28 passing yards and zero passing scores. 5. In 12 Ohio Valley Conference meetings between SPHS and RVHS, South Point held an 8-4 record over the Raiders. In its final five seasons in the Ohio Valley Conference, River Valley managed only two wins. Both of those wins came over the Pointers. Last Week: Jackson defeated Fairfield Union 31-7, in Jackson; Gallia Academy defeated River Valley 49-7, in Gallipolis. Current head-to-head streak: Jackson has won 3 straight. JHS offense last week: 323 rushing yards, 30 passing yards. GAHS offense last week: 475 rushing yards, 14 passing yards. JHS offensive leaders last week: QB Jared Icenhower 1-3-0, 23 yards; RB Blake McCoy 19 carries, 204 yards, 2TDs; WR Kendall Neal 1 reception, 23 yards. GAHS offensive leaders last week: QB Justin McClelland 1-5-0, 14 yards; RB Jacob Campbell 15 carries, 189 yards, 5TDs; WR Boo Pullins 1 reception, 14 yards. JHS defense last week: 113 rushing yards, 107 passing yards. GAHS defense last week: 98 rushing yards, 163 passing yards. 1. After a one-year hiatus, these two Southeastern Ohio Athletic League rivals will face off on the gridiron yet again. The Blue Devils are 42-40-5 against Jackson all-time, but the Ironmen have a 1348-1211 scoring advantage. 2. Last Friday, Gallia Academy ended its 14-game non-conference losing skid in a big way, winning its first OVB Community Bowl. The 42-point margin of victory is the Blue Devils’ largest win since a 58-point win over Rock Hill, on September 6, 2013. 3. Through two games, Jackson has a 32-to-24 advantage in first downs, while the Blue Devils have a 37-to-27 advantage in first downs. 4. The Blue Devils completely flipped their offense between Week 1 and Week 2. GAHS threw the ball 31 times in its season opening loss, completing just over 29 percent of their passes. In last Saturday’s win, Gallia Academy threw the ball just five times. 5. A total of six Ironmen have carried the ball through Jackson’s first two games. JHS has given the ball to lead rusher Blake McCoy on 44.3 percent of their 88 carries. McCoy has touched the ball on 41 of Jackson’s 99 plays from scrimmage this fall. Last Week: South Gallia defeated Federal Hocking 42-6, in Mercerville; Trimble defeated Belpre 44-7, in Belpre. Last meeting between the teams: September 9, 2016. Trimble won 42-0 in Glouster. Current head-to-head streak: Trimble has won 7 straight. SGHS offense last week: 397 rushing yards, 11 passing yards. THS offense last week: 303 rushing yards, 52 passing yards. SGHS offensive leaders last week: QB Kyle Northup 1-4-0, 11 yards, 1TD; RB Jeffrey Sheets 16 carries, 210 yards, 3TDs; WR Jacob Birtcher 1 reception, 11 yards, TD. THS offensive leaders last week: QB Cameron Kittle 6-12-1, 52 yards; RB Conner Wright 14 carries, 122 yards, 1TD; WR Max Hooper 2 receptions, 9 yards. SGHS defense last week: (-41) rushing yards, 164 passing yards. THS defense last week: 32 rushing yards, 92 passing yards. 1. In the previous seven meetings between these teams, THS has outscored the Rebels by a 323-66 total. SGHS has never scored more than 14 against the Tomcats. 2. The last Gallia County team to defeat Trimble was North Gallia, which defeated THS 14-7 in 1991. 3. South Gallia’s last to Glouster was September 11, 2015, when the Tomcats claimed a 44-12 win. Since joining the TVC Hocking prior to the 2010 season, SGHS has gone 0-3 in Glouster, being outscored 110-to-26. 4. South Gallia has been finishing strong, as the Rebels have outscored opponents 21-0 in the fourth quarter so far this season. 5. So far this season, sophomore Jeffrey Sheets has accounted for 245 of South Gallia’s 505 offensive yards. All but 11 of the Rebels’ offensive yards have come on the ground. Gallia Academy’s Caleb Henry (3) breaks up a pass intended for River Valley’s Brandon Call (11) during Saturday night’s non-league football game, in Bidwell.